Gray has become a surprisingly popular color for weddings in the last couple of seasons, and this trend is forecast to continue weddings. It might seem strange that such a subdued color could be the basis of a festive celebration, yet gray conveys such a chic sophistication that it really does work. There are many colors which can be paired with gray, some intuitive and some more offbeat; these are some of the most lovely gray wedding color palettes. If you want to make gray feel more romantic, pair it with pink. The soft femininity of pink smooths away the somber connotations of the gray, and becomes something very romantic and elegant. 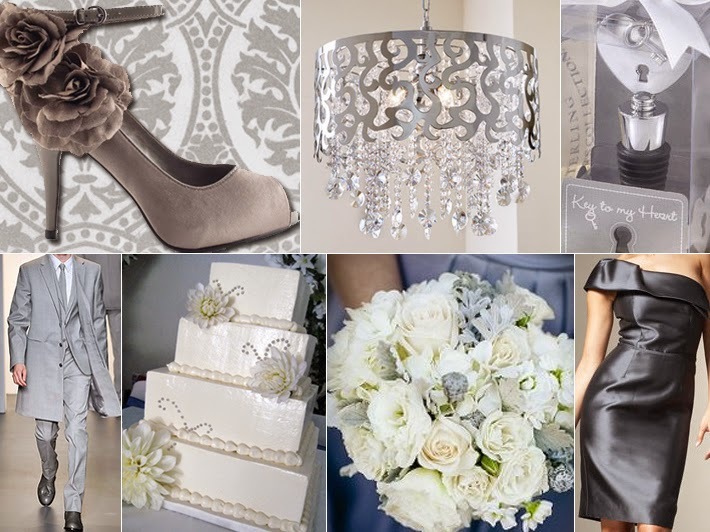 Gray makes a lovely neutral in combination with rose, especially for a daytime wedding. The groom and his groomsmen can wear gray suits instead of dark ones, which is great for morning or afternoon. The bridesmaids will look lovely in either pink or gray dresses. If you opt for gray, choose a soft fabric like chiffon to make it feel more romantic. Charcoal pearl bridesmaid jewelry would be lovely with either color dress, and of course the bouquets will be pink flowers with a gray ribbon. For a wedding color palette with a modern and offbeat flavor, consider orange and gray. Both hues have been surprise favorites recently, and they look great in combination. The vividness of the orange adds a lively touch, while the calmness of gray keeps the look grounded. The color combination will look fantastic for letterpress invitations, with the lettering in charcoal and a decorative motif in orange. A white wedding cake with a two-tone laser cut fondant scroll design would be ultra stylish. And for the centerpieces, choose orange flowers accented with grayish toned elements such as lamb's ear leaves. The entire effect will be unexpectedly lovely. Vintage inspiration is always popular, and gray can be used to great effect in this manner. Pair it with shades of plum and mauve for a Victorian inspired wedding. Host the reception in an historic mansion or on the lawn of an estate. Two-tone bridesmaid dresses in a combination of plum and mauve will be beautiful with gray crystal bridesmaid jewelry (choose a design with a vintage flair, such as chandelier earrings). The bride can wear a soft ivory gown in chiffon or lace and carry a pretty bouquet of blossoms in shades of plum and mauve; bring in the gray in the form of trailing ribbons hanging from the bridal bouquet. This would be the ideal occasion to dress the men in the traditional gray formal attire called morning suits, complete with four-in-hand ties. Gray also works beautifully with vivid colors like cherry red or lemon yellow. The combination is fantastic for creating a wedding with a dash of retro style. Picture a cake with whimsical red, charcoal, and light gray polka dots in different sizes, topped with a fun vintage bride and groom. Or how about a spring wedding with bright yellow flowers tempered with gray dupioni tablecloths stitched with a diamond pattern? 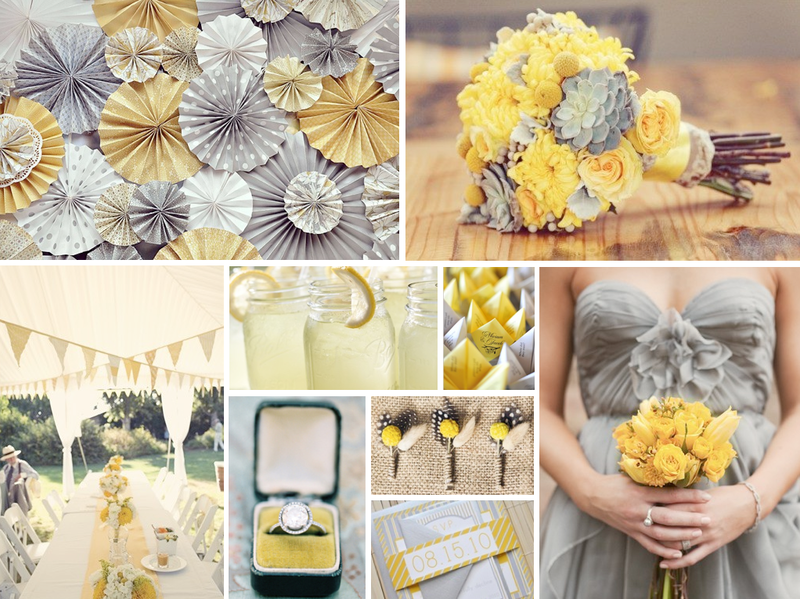 Light gray chiffon bridesmaid dresses with pretty draping on the bodice would be beautiful for a yellow and gray wedding color palette (especially because yellow is so hard to wear). The subtle background color will help the brightly colored accents to pop, which looks incredible. 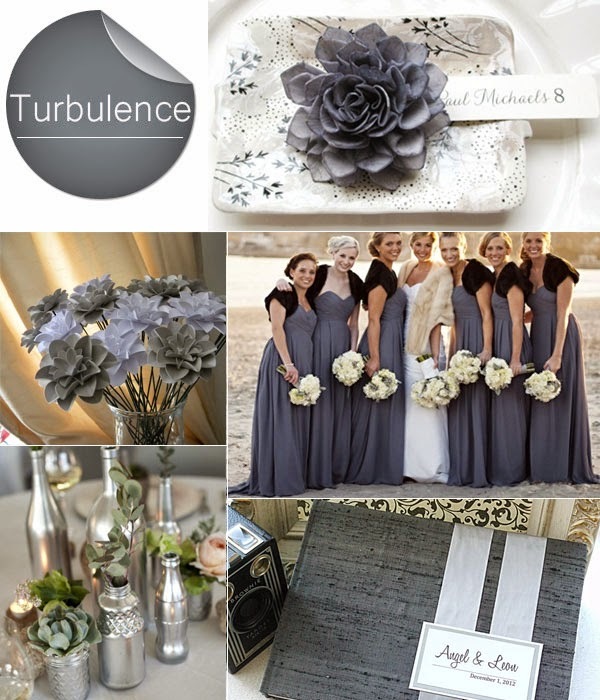 As it turns out, gray is a very versatile color around which to design a wedding - no wonder it has become so popular!